Among Catholic theologians the relationship between the universal church and the particular [local] churches is a burning question today; they continue to debate it intensely. In 1999 I published my opinion in an essay On the Office of the Bishop. In 2000 Cardinal Joseph Ratzinger responded in a lecture On the Ecclesiology of the Second Vatican Council and took a highly critical stance against my position. Since the resolution of the issue has far-reaching consequences, the debate should continue. I reached my position not from abstract reasoning but from pastoral experience. As the bishop of a large diocese, I had observed how a gap was emerging and steadily increasing between norms promulgated in Rome for the universal church and the needs and practices of our local church. A large portion of our people, including priests, could not understand the reason behind the regulations coming from the center; they tended, therefore, to ignore them. This happened concerning ethical issues, sacramental discipline and ecumenical practices. The adamant refusal of Communion to all divorced and remarried persons and the highly restrictive rules for eucharistic hospitality are good examples. No bishop should be silent or stand idly by when he finds himself in such a situation. He faces, however, an awkward dilemma. While his task is to be a bond of unity between the See of Rome and his people, he is pulled in two directions. On the one hand, he is a member of the universal episcopal college in solidarity with the pope and his brother bishops; he must therefore protect the unity of the Catholic Church. On the other hand, he is the shepherd of a local church; he must, therefore, take care of his own people, respond to their expectations and answer their questions. Has not the Second Vatican Council enjoined every bishop to listen to the faithful, especially to the clergy? But how can any bishop bring the two parties together and help them to understand each other when their minds are far apart, even to the point of holding mutually exclusive positions, as happens often in our days? If the bishop attempts to enforce the general norms ruthlessly as his Roman superiors sometimes expect, this effort is likely to be useless, even counterproductive. If he remains passive, he is quickly judged disobedient. He seems to be caught in an impasse. Yet there is a solution: the bishop must be granted enough vital space to make responsible decisions in the matter of implementing universal laws. To grant such responsible freedom does not mean opening the door to cheap compromises. It does not permit a local bishop to make concessions in matters of faith. His duty is to bear witness to the truth, whether it is opportune or not; he must always respect the integrity of our tradition. Beyond the immutable articles of faith and morals, however, there is the broad field of ecclesiastical discipline, which is essentially changeable, even when the norms were created to support, closely or loosely, some doctrinal position. Our people are well aware of the flexibility of laws and regulations; they have experienced a great deal of it over the past decades. They lived through changes that no one anticipated or even thought possible. To grant freedom to local bishops to implement universal laws responsibly is within our tradition, not contrary to it. From its beginnings, the church has developed a broad range of principles and rules for the responsible and flexible adaptation of universal regulations to particular and concrete situations. The Western church always held the cardinal virtue of prudence in high regard. When it was warranted by special circumstances, it permitted exceptions to general norms, imposed justice tempered by mercy, gave scope to equity and created an extensive system of dispensations. Moreover, the church recognized the right of the local bishop to remonstrate; that is, to suspend a new law temporarily if he judged it harmful in his territory. The Eastern church developed the doctrine and practice of oikonomia, economy: a superior wisdom that guides bishops and allows them to resolve problems that the laws cannot handle. Such principles are well grounded in sound theology, in particular in the theology of the local church and the office of the bishop. The local church is neither a province nor a department of the universal church; it is the church at a given place. The local bishop is not the delegate of the pope but is one sent by Jesus Christ. He is given personal responsibility by Christ. He receives the fullness of power through his sacramental consecration, the power that he needs to govern his diocese. This is the teaching of the Second Vatican Council. This understanding of the bishop’s office should have led to decentralization in the church’s government. The opposite happened: the trend toward centralization returned after the council. Not all the blame, however, for this reactionary development should be put on the Roman Curia. We must recognize that at times the Curia had to intervene, not because it was craving for power, but because some local churches seemed to have forgotten the need for unity so strongly emphasized in the New Testament. They let false movements develop toward excessive pluralism, local particularism and religious nationalism. More, the worldwide movement of globalization placed its own demands on the church: we live in one village, and singular solutions in particular churches are not always desirable. In addition, the ease of communication between the center and the provinces is a powerful force for unification. Less desirably, the local churches themselves can promote centralization whenever they abdicate their responsibility and turn to Rome for a decision, a ruse to evade their duty and find cover behind a superior order. Regrettably, Cardinal Ratzinger has approached the problem of the relationship between the universal church and local churches from a purely abstract and theoretical point of view, without taking into account concrete pastoral situations and experiences. When I objected to an assertion found in the Letter to the Bishops of the Catholic Church on Some Aspects of the Church Understood as Communion, issued in 1992 by the Congregation for the Doctrine of the Faith, he defended it. The assertion, criticized by many, claims that in its essential mystery, the universal church is a reality ontologically and temporally prior to every individual church. I took exception to this theory. In his response, Cardinal Ratzinger accused me of proposing an understanding of the church that has no theological depth and reduces its essence to empirically developed separate communities. This badly misrepresents and caricatures my position. I affirmed the opposite in the article to which he objects and in many other publications. Throughout my ministry as a bishop, I consistently fought against sociological tendencies that wanted to reduce the church to disconnected assemblies. Precisely because I have defended the unity of the church, I have taken many a beating. Now, wishing to avoid further misunderstandings, I offer a thorough explanation of my position. This is all the more important in that, as I see it, the resolution of the problem of the relationship between the universal church and the local churches has far-reaching pastoral and ecumenical consequences. The relationship between the universal church and the local churches cannot be explained in the abstract by way of theoretical deductions, because the church is a concrete historical reality. Under the guidance of God’s Spirit, it unfolds in history; to history, therefore, we must turn for sound theology. Among the complex historical data, the main trends of development can be discerned. The starting point must be the Scriptures. In the letters of Paul, the local church is clearly and firmly at the center. When in his principal letters Paul uses the word church (ecclesia) in the singular, he refers to a particular church or to a given community. When he speaks of churches in the plural, he refers to several local assemblies. For Paul, the one church of God comes to life in each local church. Thus there is the church of God in Corinth and so forth. The church of God is present in each of them. In the captivity letters (which in the opinion of many scholars are not by Paul), this meaning of ecclesia recedes into the background and the universal church as a whole comes into focus. In the Gospel of Luke, the word ecclesia can signify a domestic community as well as a local community; further, Luke already has a theological conception of the universal church. The early church developed from local communities. Each was presided over by a bishop; the one church of God was present in each. Because the one church was present in each and all, they were in communion. From this communion flowed appropriate practices: at least three bishops were needed to ordain a local bishop; also, from the third century on, neighboring bishops met and deliberated in synods. In A.D. 325 the Council of Nicaea gave the many churches a unifying structure: it gathered the local churches into provinces and the provinces into larger units, later called patriarchates. In 343 the Council of Sardica continued this organizational work; it even created an administrative system on the basis of the principle of subsidiarity, as we would call it today. Each particular church remained significant, but none of them had autonomy. They existed within the network of a communion of metropolitan and patriarchal churches, all of them bonded together as the universal church. From early times and within the network of communion, the See of Rome assumed a certain responsibility and authority. In the beginning of the second century, Ignatius of Antioch addressed the Roman church as presiding in charity. This address was not a statement about universal jurisdiction in doctrine and discipline; it meant that the Roman church was the leading and guiding authority in determining what the essence of Christianity was. Although Rome was the first among episcopal sees, its power was circumscribed. The decrees of the Council of Constantinople in 381 (Canon 3) and of the Council of Chalcedon in 451 (Canon 28) clearly show that the bishop of Rome possessed a leading moral authority. For the Eastern church this authority did not encompass jurisdictional power, but it was more than mere primacy of honor. In sum, the ecclesiology of the first millennium excluded a one-sided emphasis on the local churches as well as a one-sided emphasis on the universal church. Although this historical summary is brief, it contains data of fundamental importance for any further theological reflection precisely because it provides information about convictions and practices that in the first millennium were common to the churches of the East and the West. What has been our common possession in the past can be our common guide in the present. In 1976, in a lecture in Graz, Austria, Cardinal Ratzinger stated: What was possible in the church for a thousand years cannot be impossible today. In other words, Rome must not demand from the East more recognition of the doctrine of primacy than was known and practiced in the first millennium. This so-called Ratzinger proposition was well received; it had a wide echo and has become the major theme of several ecumenical dialogues. The proposition is all the more significant in that after the separation of the East from the West, that is, from the beginning of the second millennium, the West alone developed a new conception of the church that put the emphasis on universality. This trend culminated in attributing all authority to the pope. Yet Thomas of Aquinas remained cool toward such doctrine; he opposed Bonaventure, who favored it. The doctrine of absolute and exclusive papal authority played a strong role in the fight against conciliarism, the Protestant Reformation, state absolutism, Gallicanism and Josephinism. The First Vatican Council, with its teaching on the primacy of jurisdiction of the pope, reinforced it. Finally, the Code of Canon Law of 1917 put the seal on this development. The Second Vatican Council sought to revive the beliefs and attitudes of the early church and to bring them into harmony with the teachings of the First Vatican Council. It did so successfully through its enactments regarding the local church, the sacramental character of episcopal ordination and episcopal collegiality. After the council there was an effort to bring the full meaning of the council’s teaching to light through an ecclesiology of communion. In 1985 the Extraordinary Synod of Bishops stated that communion was the central and foundational idea of the Second Vatican Council. This approach has become increasingly rewarding: the idea of communion has taken the central place as the common goal of the ecumenical movement. In 1992 the Congregation for the Doctrine of Faith, in its letter to the bishops On Some Aspects of the Church Understood as Communion, approached the issue in a fundamentally positive way. It objected correctly to a one-sided ecclesiology that gave excessive weight to the local churches and saw the universal church as the end result of the coming together of local churches. Indeed, according to the teaching of Vatican II, the local churches and the universal church exist in each other. The congregation, however, went beyond the limits of the council’s doctrine, which is that the universal church exists in and from the local churches. The congregation asserted that the local churches exist in and from the universal church. Then, intending to oppose the thesis of the primacy of the local church as proposed by some theologians, it put forward the thesis of the ontological and historical priority of the universal church. Many questions can be raised concerning the position of the congregation on the basis of the historical data that we have surveyed. Indeed, it provoked a great deal of criticism, which led to a quasi-official clarification one year after the publication of the document. 1. Jesus Christ wanted only one single church. For this reason we profess in the Creed that we believe in the one, holy, Catholic and apostolic church. As we believe in one God, one redeemer Jesus Christ, one Spirit, one baptism, so we believe in one church. This one-ness is not in a future ideal that we strive to reach through the ecumenical movement: the one church exists in the present. It is not, however, a sum of the fragments of the one church as if at present each church were a mere fragment of the one church. The one church of Christ subsists in the Roman Catholic Church; it is concretely present in the same, in spite of all its weaknesses, by God’s fidelity throughout history. 2. The one church of Jesus Christ exists in and from the local churches. It exists, therefore, in each local church; it is present there especially in the celebration of the Eucharist. It follows that there can be no local church in isolation, for its own sake, but only in communion with all other local churches. As the universal church consists in and from local churches, so each local church exists in and from the one church of Jesus Christ. The unity of the universal church is a unity in communion. It excludes all egocentrism and national independence in the local churches. The local churches and the universal church mutually include each other. 3. Just as the local churches are not mere extensions or provinces of the universal church, so the universal church is not the mere sum of the local churches. The local churches and the universal church are intimately united. They share the same existence; they live within each other. The church is not like the federation of several states, nor is it like one centrally governed state. Its constitutional structure is unique; no social science can account for it. Its unity is ultimately a mystery. It is constituted after the image of the Trinity, one God in three persons. The unity of the church is not uniformity; it includes diversity. In affirming these three points, I think I am in substantial agreement with Henri de Lubac, who expressed such essentials in a concise formula: Whenever there is mutual presence and inclusion, there is a perfect relationship. The Congregation for the Doctrine of the Faith in its documents exceeded these essentials when it used this doctrine of mutual inclusion to assert the primacy of the universal church. To validate such an assertion, valid proofs would be necessary. Cardinal Ratzinger defends the thesis of the historical and ontological primacy of the universal church over the local churches with arguments from historical sources and systematic reflections. He claims that the doctrine of the primacy of the universal church follows from the history of the Pentecostal event reported by Luke in the Acts of the Apostles. In time, the church comes into existence on the day of Pentecost. It is the community of the 120, with Mary and the Twelve Apostles. There the Apostles represent the one church; later they will be the founders of the local churches. They are the carriers of a message sent to the whole world. The church already speaks all the languages. This argumentation is highly questionable. Many exegetes are convinced that the Pentecostal event in the Acts of the Apostles is a construction by Luke. Similar Pentecostal events also occurred, probably from the beginning, in the communities of Galilee. Further, Michael Theobald [a professor of theology at the Centre Sèvres in Paris] correctly noted that the narration of the Pentecostal event does not refer to the universal church as such but to the gathering of the Jewish diaspora, which in the course of time, through the guidance of the Holy Spirit, will expand into a church of all nations. This is what Luke intended to show. The correct history of the beginnings of the church is found comprehensively in the narrations of its initial expansion and not in Luke’s isolated passage about Pentecost. Clearly, Cardinal Ratzinger must be aware of the weakness of his historical argument, because he admits that a historical proof is difficult; hence the issue must be decided, ultimately, on the basis of the intrinsic connection between the universal church and the local churches. The strength of the proof of the ontological primacy [as distinct from the historical one] is therefore the more important issue. But in what does this proof consist? Surprisingly, Cardinal Ratzinger grounds his theory of the ontological primacy in a thesis about the pre-existence of the church. He finds the justification for this thesis in the words of Paul the Apostle, who speaks of the heavenly Jerusalem from above as our mother, as the city of the living God, the community, ecclesia, of the firstborn whose names are written in heaven (see Heb. 12:22 ff.). The Fathers of the Church Clement, Origen and Augustine commented amply on this text. Also, the idea of pre-existence had its parallel in early Judaism: it was a widespread opinion that the Torah was a heavenly reality before the creation of the world. Similar conceptions were current in other religions and in the schools of Platonic philosophy. By this doctrine of the pre-existence of the church, St. Paul means that the church is not the product of accidental historical circumstances, developments and decisions but is grounded in the eternal saving will of God. Its origins lie in the eternal mystery of God who saves. This is precisely what Paul is stressing when in his letters he speaks of the eternal saving mystery of God that was hidden in earlier times but is manifest now in the church and through the church (Eph. 1:3-14; 3:3-12; Col. 1-26 ff.). Such a pre-existence of the church cannot be contested; it is indispensable for the correct theological understanding of the church. But it is not an argument in favor of the ontological primacy of the universal church. Who would assert that when Paul speaks of the pre-existence of the church in God’s saving will, he refers only to the universal church and not to the concrete historical church that exists in and from the local churches? Who would say that the one historical church, existing in and from the local churches, does not pre-exist in its entirety in God’s mystery? The Pauline texts about the pre-existence of the church do not at all support the thesis about the pre-existence of the universal church. They do support, however, the doctrine defended by me and many others of the simultaneous pre-existence of the universal church and the particular churches. Cardinal Ratzinger’s doctrinal reflections fail to prove the primacy of the universal church, just as the historical arguments failed. The pre-existence of the church must be understood as the concrete church that consists in and from particular churches. No less a scholar than Henri de Lubac stated, "A universal church which would have a separate existence, or which someone imagined as existing outside the particular churches, is a mere abstraction." He explained further: "God does not love empty abstractions. He loves concrete human beings of flesh and blood. God’s eternal saving will intended the incarnation of the Logos in view of the concrete church composed of people of flesh and blood." When the question of the primacy of the churches is critically examined, it becomes clear that the debate is not about any point of Catholic doctrine. The conflict is between theological opinions and underlying philosophical assumptions. One side [Ratzinger] proceeds by Plato’s method; its starting point is the primacy of an idea that is a universal concept. The other side [Kasper] follows Aristotle’s approach and sees the universal as existing in a concrete reality. Aristotle’s approach, of course, should not be misconstrued as if it were reducing all knowledge to mere empirical data. The medieval controversy between the Platonic and the Aristotelian schools was a debate within the parameters of the common Catholic faith. Thus Bonaventure and Thomas Aquinas chose different paths in their approach to theological issues, including the matter of the universal authority of the pope. Yet both are revered as doctors of the church; both are honored as saints. If such a diversity was admitted in the Middle Ages, why should it not be recognized as possible today? The resolution of the relationship between the universal church and the local churches is highly relevant for the pastoral situations that I mentioned at the beginning of this article. Originally, I myself regarded the issue as a pastoral one within the church. Now I see it as a major problem affecting our relations with other Christian churches. The goal of the ecumenical movement is not unity in uniformity but the existence of one church embracing peacefully a great diversity. The particular churches must remain churches, and yet more and more they must become one church. The goal of the ecumenical movement is therefore unity through the communion of the churches, oneness in communion. In the large ecumenical world, we cannot credibly advocate such a goal unless in our own Catholic Church we promote a healthy relationship between the universal church and the particular churches unless, that is, we promote both unity and diversity. A one-sided emphasis on universality is bound to awake painful memories and provoke mistrust; it frightens away other Christians. In our dialogues with the Orthodox and the Protestant churches (ecclesial communities), it is important to make clear that a particular church cannot be fully a church of Jesus Christ outside the community that is universal. Such unity in communion does not oppress the legitimate traditions of the particular churches; it brings them space for freedom. No Christian community will ever find another way toward the fullness of the church of Christ. Such a balance between the universal church and the local churches does not oppose the ministry of the papacy; quite the contrary, the papacy has as its principal task to create such a balance. The pope’s mission is to strengthen his brethren. He must therefore strengthen and hold them together in the unity of the episcopate and the local churches. Pope John Paul II invited the churches to an ecumenical dialogue to see how all this can be accomplished in the concrete order. When the pope issues an invitation to such a friendly dialogue, then surely it cannot be improper to express one’s opinion concerning the relationship between the universal church and the local churches. How refreshing it was to see such a hope-filled article (“On the Church,” 4/23). How good it was to see one of our most respected bishops thoughtfully say, “No! There is another way of looking at church!” How I wish there were more bishops like Walter Kasper. I write this comment as one who sees the Roman leadership captured by fear, a fear that it is losing control of the people of God. As a result, this leadership is resorting to tactics of power and control. To hear Cardinal Kasper say that the right balance between the universal church and the local church has been destroyed is disturbing, but it is honest; it is the truth. I thank Walter Kasper for his courage and scholarship. I urge other bishops to follow his lead...to give us hope. Cardinal Walter Kasper (“On the Church,” 4/23) thinks that a correct understanding of the relationship between the universal church and the local churches would lead to a different solution—or at least to differing acceptable solutions—on “ethical issues, sacramental discipline and ecumenical practices.” As examples he cites the giving or denying of Communion to divorced/invalidly remarried Catholics and the “highly restrictive” rules for eucharistic hospitality. But nothing in Cardinal Kasper’s essay offers proof that the sacramental/ecclesiological truths that govern solutions to these issues and the binding disciplinary norms that safeguard these solutions would be evaluated differently because one speaks from the center (Rome) or from the local churches. It is true, of course, that three local ordinaries (including the then Bishop Kasper of Rottenburg-Stuttgart) put forward (1993) a position on the Communion issue that was firmly rejected by the Holy See (1994). But it’s equally true that other local churches—for example, the entire Province of Pennsylvania (eight Latin ordinaries with the auxiliary bishops and two Eastern Church ordinaries located therein) strongly contested the position of the then Bishop Kasper, Archbishop Oscar Saier and the then Bishop (now Cardinal) Karl Lehmann. It seems that Cardinal Kasper is dissatisfied with the content of the solution, regardless of its source, and wants the local churches to be able to go their own way with, for example, the Communion issue, just as with fast and abstinence regulations or placing the solemnity of the Ascension on a Sunday, issues of radically diverse significance. The key question thus seems to be whether a teaching and its disciplinary norm need to be uniform throughout the church and by what doctrinal and theological principles we come to this determination, whether at the level of the universal church or within the local churches. The controversy then hinges not on the proper relationship of the universal church and the local churches (something that indeed merits clarification) but on fundamental doctrinal and theological principles. Cardinal Walter Kasper’s written and very self-defensive response, “On the Church” (4/23), to Cardinal Ratzinger’s lecture can be summed up in a single and very dangerous word—syncretism. America is to be thanked for publishing Cardinal Walter Kasper’s response to Cardinal Joseph Ratzinger, “On the Church” (4/23). It comes as a great relief and source of hope to many of us who love the church yet are critical of some pronouncements coming from Rome to know that Cardinal Kasper not only disagrees with Cardinal Ratzinger’s ecclesiology, but does so in an outspoken and public—albeit “friendly”—manner. Cardinal Ratzinger has met his match in this colleague “prince” of the church and superb theologian. I am grateful to Cardinal Avery Dulles for his letter concerning the translation of Walter Kasper’s “Friendly Reply” (4/23) to Cardinal Joseph Ratzinger’s article; it gives me an opportunity to offer some needed clarifications. A literal translation was never intended; a good deal of the original (which was a segment in a series of exchanges) would not have been fully intelligible to American readers without proper information about its context. For this reason, the permission to translate was requested from the editor of the original with the explicit proviso that “it could not be a straight translation; some adaptation would be necessary.” Accordingly, I prefaced the English text with a caution: it was a “translation from the German, with some adaptation.” This sentence was somehow omitted in the editorial process, in which I had no part. The question is, therefore, whether or not the adaptations to help the American readers were reasonable. Kasper’s original text assumed what was of common knowledge in Germany but not in the United States, such as the repeated refusal on the part of the Vatican to admit to the Eucharist couples living in legally invalid marriages but deserving in faith and charity and to let the local bishops have greater discretion in matters of eucharistic hospitality, and so forth. The full meaning of the original text, its stance and strength, would have been lost on American readers without due contextualization. Nothing was added but bare historical facts; none of the facts was incorrect. The refusal by the Vatican was indeed “adamant,” it was applicable to “all” cases, and the rules concerning eucharistic hospitality were truly more “restrictive” than the aspirations of responsible local ecumenists—pastors included. This dispute about such textual matters, however, should not distract us from the substantive issue that is the theme of Kasper’s article. What did Vatican Council II profess when it declared that the universal church exists “in and from” the local churches? The question is far-reaching, and the answer is bound to affect the church’s government as well as the daily life of God’s people. If ever there was an urgent need for dialogue, for “faith seeking understanding,” and for an intense process of inquiry, this is it. Would Cardinal Dulles be willing to partake in such a worthy dialogue—friendly, as well, as it must be? Thank you for publishing the translation of Cardinal Walter Kasper’s letter concerning the relationship between the universal church and the local churches (4/23). It certainly was a friendly and gentle expression of his opinion. The commentary by Raymond Brown, S.S., on John 10 would give very strong support. “Figures of authority in the church tend to become all-important in the eyes of those whom they were meant to serve; their presence is immediate, and often it seems that Jesus is reached chiefly through them and their activities. For John the immediacy of Jesus is crucially important because only he can give God’s life.... The Johannine insistence that Jesus is the good or model shepherd and that all others are thieves and bandits is challenging.... Such language is bound to have a dynamism in making Christians qualify the role of their own leaders” (A Once-and-Coming Spirit at Pentecost). With regard to “Cardinal Walter Kasper’s ‘Friendly Reply’ to Cardinal Joseph Ratzinger” (4/23), the title on your cover is misleading, since Walter Kasper wrote and published the article in German, not as a cardinal but as a bishop, in 2000. More importantly, the English translator has taken considerable liberties in sharpening the language. For instance, with reference to the lack of understanding of some Roman directives on the part of local clergy and laity, the English text states: “The adamant refusal of Communion to all divorced and remarried persons and the highly restrictive rules for eucharistic hospitality are good examples.” But the words “adamant,” “all” and “highly restrictive” (italicized in my text) have no equivalents in the German, which, accurately translated, would read: “This affects ethical questions such as questions of sacramental and ecumenical practice, for example, the admission of divorced and remarried persons to Communion or the practice of eucharistic hospitality.” (“Dies betrifft ethische Fragen wie Fragen der sakramentalen und der okumenischen Praxis, etwa die Zulassung wiederveheirateter Geschiedener zur Kommunion oder die Praxis eurcharistischer Gastfreundschaft.”) The tone of the article has been changed to make it appear inflammatory. Whether the various local churches should be free to decide these issues for themselves, as Kasper maintains, is quite another question. I would regard them as matters in which local churches ought not to go their own way, since the very nature of the Eucharist as a sign of communion is at stake. 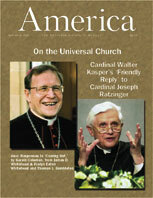 In Cardinal Walter Kasper’s article, “On the Church” (4/23), there is a puzzling paragraph (p. 11, top of first column): “In the Gospel of Luke, the word ecclesia can signify a domestic community as well as a local community; further, Luke already has a theological conception of the universal church.” The word ecclesia doesn’t occur at all in the Gospel of Luke. Is the Cardinal talking rather about Luke’s Acts of the Apostles? Editor: The reference should have been to Luke’s Acts of the Apostles. America regrets the error, which did not appear in Cardinal Kasper’s original text. I am prompted by the cover article of the April 23 issue to extend my thanks to you for your work on behalf of the church. Even had Pope John Paul II not recently honored Walter Kasper with the “red hat,” his words “On the Church” alone would merit him the title “Eminence.” Indeed, those insights of Cardinal Kasper’s “friendly reply” to Cardinal Ratzinger clearly indicate that he is well chosen for the presidency of the Pontifical Council for Promoting Christian Unity. If he brings the same pastoral vision to that ministry which he exhibits in his words published in America, we can look forward with great hope. He certainly has brought hope to many of us within the church who have begun to doubt whether the vision we remember from the Second Vatican Council is the same as the viewpoint that seems to be prevalent in other members of the Roman Curia or in the current hierarchy in the United States. This article also appeared in print, under the headline "On the Church," in the April 23, 2001 issue. Walter Kasper, the bishop of Rottenburg-Stuttgart, Germany, from 1989 to 1999, was formerly a professor of theology at the University of Tbingen. He was made a cardinal in February of this year and soon after was appointed president of the Pontifial Council for Promoting Christian Unity. The German text of the present article was originally published in the journal Stimmen der Zeit (December 2000). The translation was prepared by Ladislas Orsy, S.J., a visiting professor at Georgetown University Law Center in Washington, D.C.